The sound of this fountain is just what I want for my backyard. Of course, I don't want to pay for the electricity to power such a super-sized water pump, the water comes out fast to make such waterfall sounds. I know what you mean about that wnderful sound. I have a cousin that built a house right by a 'real' waterfall! Good grief - that's errr, certainly on the Hummer side of backyard water features! I'd take it, but then we have enough rain here anyway. 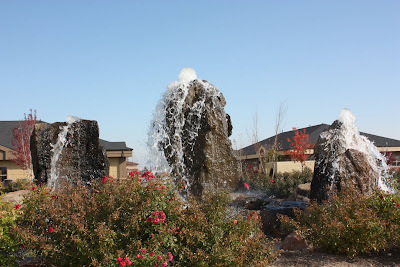 I love the sounds of water fountains and waterfalls...so very peaceful and relaxing. I thought about buying one of those mini-waterfalls to keep on a desk at home...but so far haven't done so. One I looked at you had to clap your hands to activate every so often. Now the water fountain you've posted....now that's a water fountain that anyone would want! Like Sally, I was thinking "over the top" too. Maybe if you had a really big backyard. Oooo that would be great in the garden! But, like you say, a bit on the large side and probably expensive to run. Sigh. I've always wanted a fountain too, but it's just not practical — such a waste of power and water (it'll evaporate fast in our heat and will need replenishment often). I can't even bring myself to get a tiny desktop version because it still requires electricity.